We can make a lot of things with lemon’s peel. For example, it’s ideal as air fresher, since it’s citrus scent is delicious. It’s also useful for decorating, for cleaning and even for making natural beauty products. If you use your imagination, you’ll think about a lot of ideas to use this aromatic peel. Here, we’ll give you a review of the ones we like the most! 1. Decorating candles. 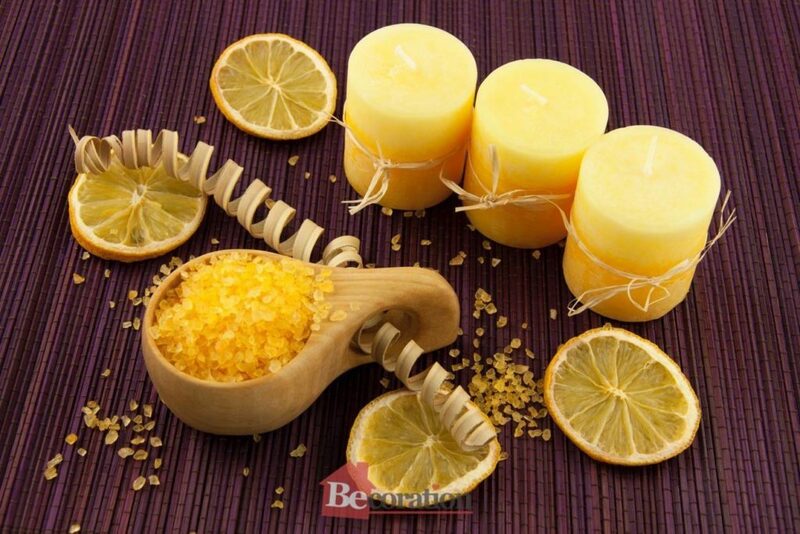 You can use the peel in strips or even in slices to decorate your candles. It will give a fresh touch to your room and the scent will be superb! 2. Drying the peel. This is a great idea. You can cut the lemon in slices, peel it or whatever you prefer. Then you can dry it in the microwave and the result will be fantastic. You can use to make centerpieces, necklaces, earrings and much more. 3. Homemade compost. You can add the lemon’s peel to your homemade compost. You’ll get an amazing fertilizer and the best part is that it will be completely organic. A good idea to make your flowers grow like never before! 4.Descaling product. Lemon is a powerful descaling product, that’s why it’s perfect for cleaning, even some kind of floors. It’s really effective to degrease and if you mix it with other products, the result may be even better! 5. Creating flowers. If you peel the lemon all at once and roll it over itself, you’ll get a beautiful flower. Not only because of the color but also because of the spectacular scent. As you can see, there are plenty of ideas to use the lemon’s peel. These are just some examples, but you can also use it to prepare really yummy deserts and much more. We hope you liked this post! If you have more ideas you’d like to share, you can do it in the comments or in our Facebook page!